In the United States, many are freezing and looking for warmth. Halfway around the world, Norwegian musician Terje Isungset has built a career dependent on frigid weather. 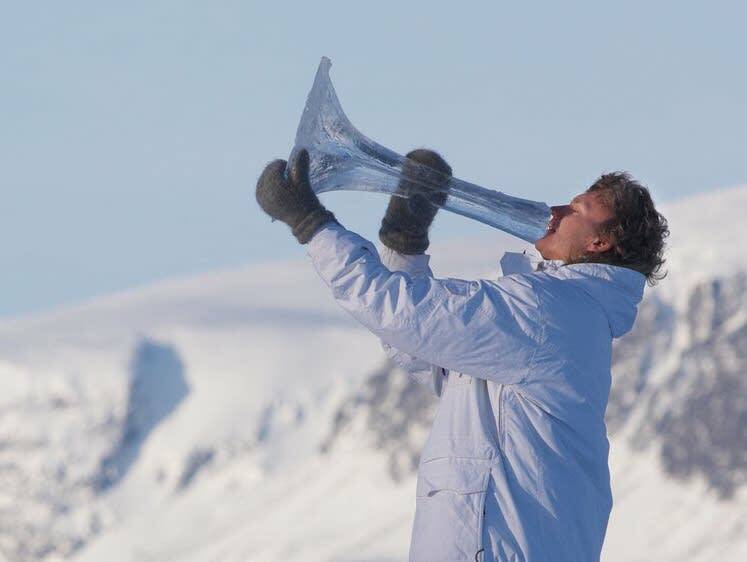 Terje Isungset is a Norwegian musician who makes his own instruments -- out of ice. Among his creations are "icehorns," a xylophone-shaped instrument called an "iceofon," guitars, harps and even even saxophones sculpted from huge chunks of ice using chainsaws. He is also one of the minds behind Ice Music Festival, where entire venues are created out of ice and and performers play instruments specially constructed for the event. This year's festival will take place in Finse, Norway in February. Terje has been working with ice for nearly 20 years, but as he told me, he doesn't always have control over how his creations turn out. I reached Isungset in Russia, where he's currently traveling and playing ice music, building his instruments on the same day he performs with them. You can find Terje Isungset's music at what he calls "the only record company in the world building new recording studios for every recording": All Ice Records.